If you ever find yourself driving a convertible with the top down along a long, desert highway with cacti dotting the barren and a sandy landscape, you should definitely be jamming out to the Allah-Las for the ride. The California psych rockers have managed to bottle up the essence of 1960s psych rock and deliver it to our ears here in the 21st century. 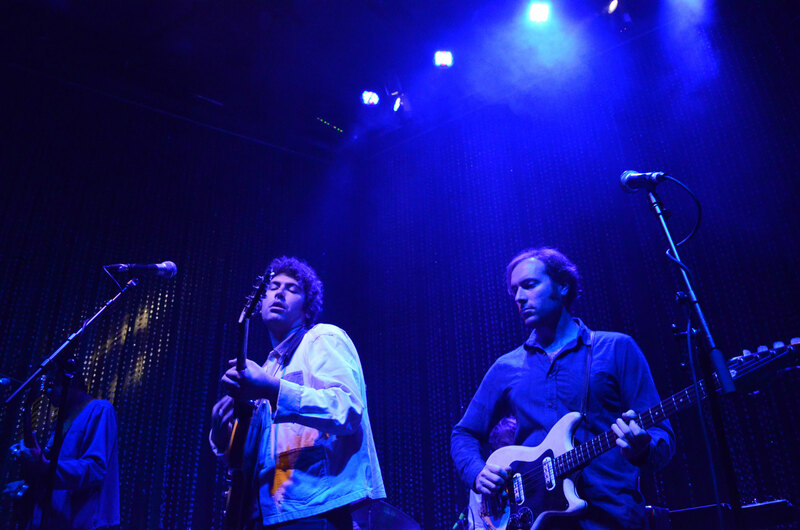 At Fishtown’s famed Johnny Brenda’s Sept. 19, the Allah-Las took a sold-out crowd on a sweet ride back in time. Canadian band TOPS got the night underway with some groovy, laid back indie rock. It’s hard to put a finger on exactly who TOPS sounds like but after hearing a few songs their sound struck me as a kind of indie elevator music or music that plays during “Local on the 8s” on the Weather Channel, but in a good way! Lead singer and keyboardist Jane Penny really showed off her vocal prowess. At times she could sing soft, crooning almost, but then she’d ratchet it up and start to sound a little like Grace Slick of yesteryear. TOPS’ best song of the night was easily “Way to Be Loved;” that song is top notch. Check it out on YouTube (there is a neat music video and everything.) Performed live the song takes on a little more urgency. David Carriere’s guitar work is understated but perfect for the song, with a snazzy little riff that gets stuck in your head for days. Check TOPS out if you get a chance, with two albums under their belt they are coming up fast. At around 10:30 p.m. the guys from Allah-Las came on stage to a roar of applause. Everything from their vintage guitars to their sharp duds and loafers harkened back to those days of laid-back, sunwashed rockers from the ’60s and ’70s. They kicked off with “Ferus Gallery” a tremendous instrumental track from their second album “Worship the Sun.” It is hard for me to explain just how awesome this song is, but as a top-notch student journalist I will do my darndest to do just that. Two electric guitars work in tandem as the bass line slinks alongside them with the drums ever present off in the background. Then this keyboard part comes in out of nowhere to set the mood before guitarist Pedrum Siadatian rips off a quick little solo. Check out this song I tell you it is something out of the opening montage of an old James Bond movie or something. The group’s vocal skills are out of this world. There are harmonized backing vocals on tracks like “Follow You Down” or “Calm Me Down” that draw similarities to the Beatles. Each main band member took a turn or two on lead vocals, relieving lead singer Miles Michaud of his duties now and again. Drummer Matthew Correia was a delightful surprise on main vocals on the aforementioned “Calm Me Down” (while playing drums to boot) as well as during “Long Journey” (where Correia came to the front as Michaud took over on drums). You don’t see many bands doing vocal work like the Allah-Las and it is a real treat to see live. The Allah-Las’ latest album “Calico Review” channels even more of a Western, Texas vibe especially on songs like “Strange Heat” and “Famous Phone Figure.” “Could Be You” is my favorite song from “Calico Review” and it did not disappoint live. For all the merits that “Calico Review” has, it was older tracks from their self-titled first album that rocked the hardest. “Tell Me (What’s on Your Mind)” blew my doors right off. Michaud really goes for it while singing the bridge, exuding this raw, unbridled energy that was almost like electricity in the air. He brought the same kind of energy to play the tambourine during the band’s final song, “Every Girl.” It was the perfect way to end the night. The Allah-Las packed a sold-out Johnny Brenda’s crowd in a time machine and unloaded them in middle of the psychedelic rock era. It was a pure pleasure to experience the band’s 21st century reinvention of the rock ‘n’ roll of a bygone era. There is something beautiful in the vibe and atmosphere that the guys from Allah-Las create and it is most definitely something you should take the opportunity to check out, whether it be hearing them in person, through headphones or through your car’s speakers on a long, sunny drive.